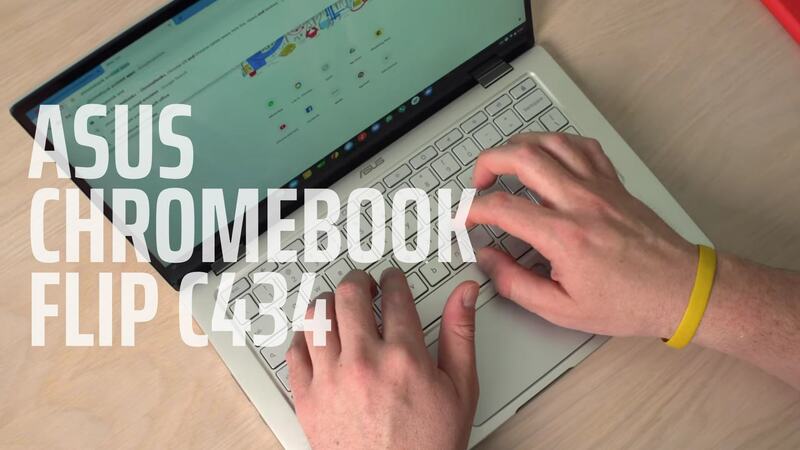 After seeing the ASUS Chromebook Flip C434 in Vegas at CES 2019, I couldn’t wait to get it in the office for review. When news broke last month that it was finally becoming available for sale, I jumped on the opportunity to purchase one. Sure, we’ll likely get a review unit in from ASUS at some point in the next few weeks, but I wasn’t ready to wait around on this device. You see, the ASUS Chromebook Flip C302 was one of the most-loved Chromebooks ever made and this follow up is going to be one of the most eagerly anticipated releases of 2019. When news broke that it was available and shipping, I couldn’t resist. My general impatience and impulsiveness were in full effect and, this time around, served me very well. I’m one of a small crowd that has been lucky enough to get some solid hands-on time with this latest Chromebook for the past week. In that time, I’ve formed a few opinions and changed others that I had after the initial unboxing. I’m taking a bit more time on this review than I normally do because of the heightened expectations surrounding this Chromebook, so I wanted to offer up a few initial thoughts and observations as I begin finalizing the review. First up, the fit and finish is what we were hoping for in a follow-up to the Flip C302. The aluminum is quality, light, and looks great. The body of the device feels like a 12 or 13-inch device but with a 14-inch screen and that is mainly due to the minimized bezels surrounding the screen. So that is my second observation: I love – LOVE – the bezels on this device. The screen is good and I enjoy it just fine, but the game-changer here is the minimal bezels. It allows the entire experience of using this device to happen. I cannot overstate how pleasing it is to gaze upon this screen during the work day. Never mind the fact that it decreases the entire frame to such a small, light package. Sure, it is a pretty standard 16:9 FHD panel that tends a bit warmer than I prefer, but the minimal surround makes it feel fresh, modern, and SO attractive. I do wish it was a bit brighter as I struggled in a coffee shop with lots of windows on one occasion. Third, I really enjoy the keyboard on the Flip C434. At first, I thought the action was a bit mushy, but I’ve really come around to enjoying the typing experience. The silver keys and backlighting look really cool, too, so that’s a nice perk. Additionally, the keys are very quiet. The trackpad has been a solid performer as well even though the second day I was a bit concerned with the surface. I’ve since figured I was in an overly-humid room at the time and I think any trackpad would have struggled. Every other day has been great with it and the click mechanism feels solid and I’ve had no concerns since. Last, let’s talk about performance. The Core m3 in this Chromebook is moving along as fast as expected, scoring 30,000 on Octane and not really giving me any concerns at all. For many people, the bigger concern here is the somewhat paltry 4GB of RAM, but, so far I’ve not had much issue. I did run into one scenario where I had a ton of tabs and apps open and then began resizing ridiculously-large photos (15-20MB each) and I lost a few tabs due to memory management. It was the only time I saw a performance hiccup, however. Battery seems to be performing as expected as well, yeilding around 7-8 hours when I have the screen brightness cranked up and getting closer to that 10 hour mark when I keep the screen at 75% or so. Again, these are initial observations and I may change my tune a bit after more testing. Overall, though, I think the full review on this device is likely to be quite complimentary. It feels like ASUS really thought about the general Chromebook experience when putting this laptop together and the attention to detail shows. Look for our full review in the near future when we should start seeing the Flip C434 begin shipping in earnest from most retailers. Amazon is currently showing a ship date of 1-4 weeks, but as supply comes in we’d expect that to change. For now, just know that this Chromebook is a legitimate contender for your hard-earned dollars and a true, worthy successor to the Flip C302.